Having returned from Burning Man about 2 weeks ago, I was struck by how much it taught me about the future of our fast evolving digital media industry. Chaos Theory came to mind. The enactment of seemingly random acts interconnecting to form a cohesive whole or interrelated structure. Overall a terrific reflection on the discourse surrounding media fragmentation over the last 10 years and how media leadership has struggled to catch up. (Media giants continue to align in their struggle to understand and contain the beast). So, what’s this all mean? Confirmation of course that this will only get ‘worse’ or ‘better’ depending on your ‘glass half full/half empty’ POV. I go for the latter, but a stark reminder at how no-one-industry will ever be able to ‘plan’ or ‘track’ all media vehicles every again. So how is this related to Burning Man and my experience there? For one, the event is a random gathering of folks from around the world with few rules, generous amounts of energy and creativity that are constantly rewarded by random acts of kindness. Sound familiar? As chaotic as it all seems, it all works – all the while continuously creating customized experiences for us in order to form deeper emotional connections as we continue to move away from the vanilla flavors we were forced to consume before. Keep in mind that as primitive and bohemian as this festival is, most participants are superbly socially and technologically connected. Not at the event of course (this is how we escape from it all), but off of the playa – this group are the thought leaders and pool of influencers that are in fact inventing much of the new media being developed today. 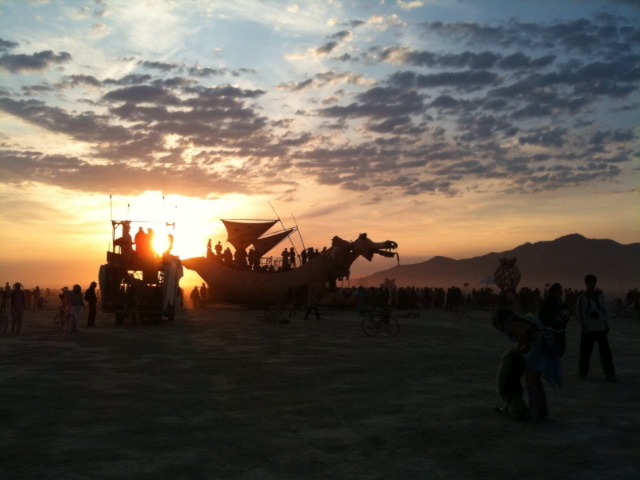 This entry was posted in All and tagged burning man, chaos theory, digital media, edelman digital, jared hendler, social media. Bookmark the permalink. « Credit card, solar powered parking meters!